❥Good and Useful Decorative Accessory,so good for your kids, they will love it and use it all the time for every meal. ❥Light weight and durable spoon with mirror polish and no sharp edges,The Sugar Skull tea spoon is a mischievous little gift for those who need reminding to take a little less sugar in their tea & coffee. ❥This spooky spoon has lively eye socket and nose, especially while scoop up solid things like sugar, powdered creamer and then clear skull there it is. ❥They would also be a wonderful spoon to stirringyour morning coffee or tea . Dear buyers ,Have a nice day . All the products are ONLY 'Sold by MLCoolife and Fulfilled by Amazon. Warranty: lifetime . Good quality and service is our promise to you . If you have any questions please feel free to send a message to us . Thank you . 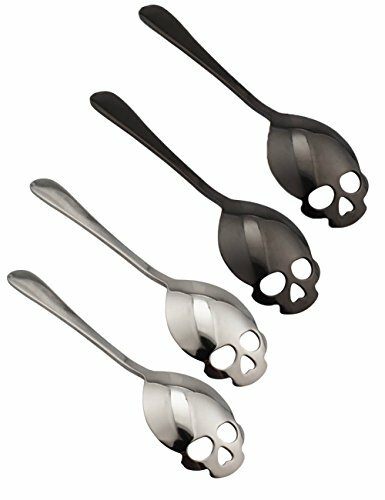 ❥Cool and stylish design, ideal gift for spoon collectors who are obsessed with skulls.The openings for eyes and nose make it easy to shake off excess calories in a teaspoon of sugar; Perfect for tea and coffee stirring; Can also be used as dessert spoon and absinthe spoon. ❥DIMENSIONS - Tea spoon measures 6 x 1.3 x 0.5 inch. Net Weight: 25g. Pack of 4. ❥Made of high-grade 18/10 stainless steel (304 Grade), sturdier and shinier than other stainless steel; Mirror polish, no sharp edges. If you have any questions about this product by Mochiii, contact us by completing and submitting the form below. If you are looking for a specif part number, please include it with your message.